For rare-book collectors, an original copy of the Gutenberg Bible — there are only forty-eight in existence — represents the ultimate prize. When Estelle Doheny, the eccentric widow of oil tycoon Edward Doheny, finally obtained an original copy, it was the culmination of a forty-year pursuit. Estelle, the first woman and perhaps the most devout owner of the Bible, would be its last private owner as well. 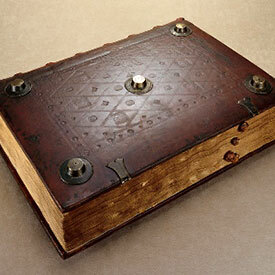 After her death, the unique Bible would go on to enable scientists — using the very machine that first isolated plutonium for the atomic bomb — to make the most important advance in understanding the first printed book. 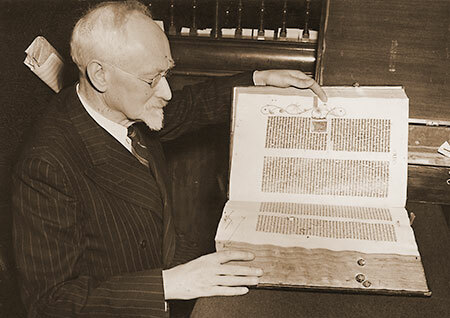 London Book Dealer Ernest Maggs gazes at the pages of the Gutenberg Bible following the 1947 auction. The vellum thumb markers used to designate sections of the bible are visible along the book’s foredge. Telegram from American Dealer A.S.W. 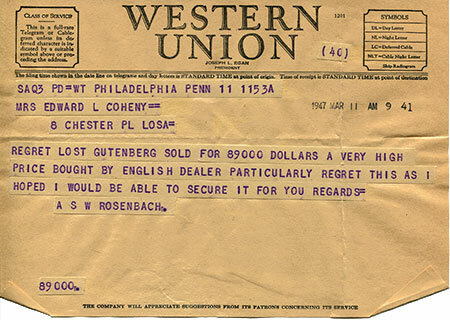 Rosenbach to Estelle Doheny informing her that the Gutenberg Bible she coveted had gone to another book dealer in March, 1947. 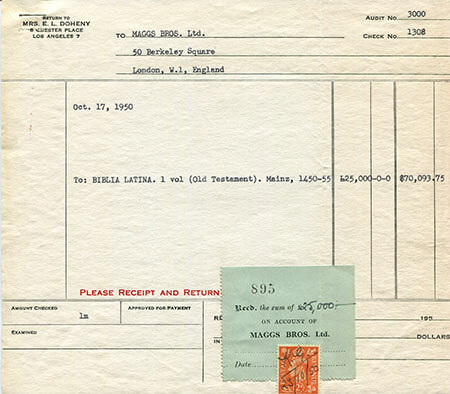 The Bill of Sale for the Gutenberg Bible dated October 2, 1950. Estelle Doheny had given up on ever owning the Bible when the copy she had lost suddenly became available. Thanks to an unusually strong dollar, she was able to claim one of civilization‘s great artifacts for a bargain price. In The Lost Gutenberg, Margaret Leslie Davis richly recounts five centuries in the life of this copy of the Bible, from its very creation by Johannes Gutenberg in Mainz, Germany; to its ownership by the British heir to the Lea & Perrins Worcestershire sauce empire; to its brush with one of the most notorious crimes of the twentieth century, the Teapot Dome scandal; to its ultimate resting place, in a steel vault in Tokyo. 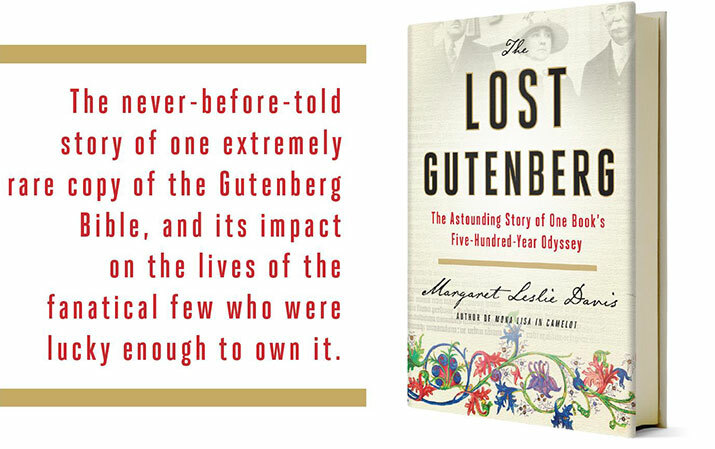 The Lost Gutenberg draws readers into this incredible saga, inviting them into the colorful lives of each of its collectors along the way. Through vivid storytelling and unprecedented access into private records, Davis offers a unique and riveting history for bibliophiles and book lovers combined. Exploring books as objects of desire across centuries, Davis will leave readers not only with a broader understanding of the culture of rare book collectors, but with a deeper awareness of the importance of books in our world. 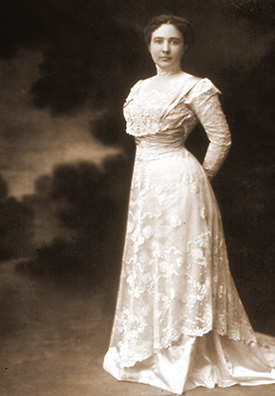 Estelle Doheny soon after her marriage to oil tycoon Edward Doheny, circa 1900. She was the unseen telephone operator connecting his calls to oil investors and Doheny claimed he was entranced by her voice. They married after a short courtship. The cover of the Doheny Gutenberg Bible #45 in its original fifteenth-century binding of age-darkened calfskin stretched over heavy wood boards, circa 1456. 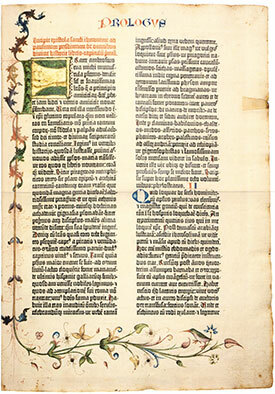 A striking green F and delicately drawn foliage distinguish the first page of the Doheny Gutenberg Bible, printed in Mainz, Germany sometime before August 15, 1456. 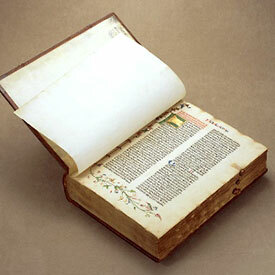 Number 45 was the first Gutenberg Bible to enter the digital frontier. No longer a three-dimensional book of ink printed on paper, the virtual Gutenberg is now a twenty-first century creation of the digital age. Today, Number 45 resides in a library vault at Keio University in Tokyo, Japan. 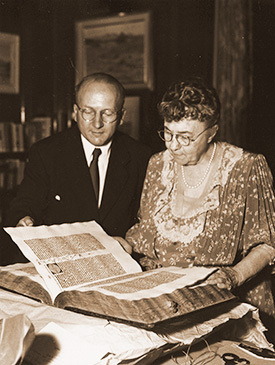 Estelle Doheny with Robert O. Schad, curator of rare books at the Henry E. Huntington Library examine the Gutenberg Bible soon after its arrival in Los Angeles in October, 1950.